Connie, a friend of mine who loves handwork, introduced me to these awesome finger pads. I don't know about you, but when I am hand sewing, the middle finger of my right hand gets stabbed as it is pushing the needle towards the fabric. 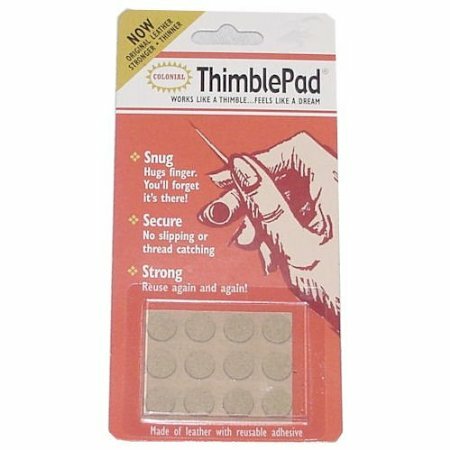 I used to work with Thimble-It, but these are much softer, last a long time, and are very convenient to use. Thimble-It is made of plastic, so often the needle would slip and hurt me. ThimblePad is a piece of soft leather with adhesive on the back. The adhesive is very strong and reusable, and the leather prevents the needle from slipping. It is so comfortable, it is easy to forget you have it on. It is more expensive than the other product, but it is worth it. Just figured I would pass on the tip! Great idea. I will give them a try. My thimbles dont always fit with my nails. I love this product. I have a problem keeping thimbles on my finger, but these stick right on the spot that I use most often on my finger to push the needle through. You are right - they are so light that sometimes I forget I have one on.